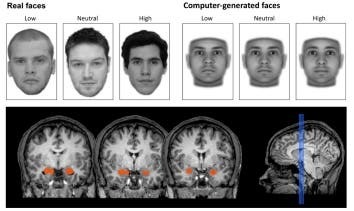 A new study adds to a body of evidence that suggests the brain is involved in a unconscious process of screening human faces for patterns that suggest trustworthiness or otherwise. Namely, our brains are busy judging other people based on their physical features even when we aren’t even get the chance to properly see those features. “Our findings suggest that the brain automatically responds to a face’s trustworthiness before it is even consciously perceived,” explains Jonathan Freeman, an assistant professor in New York University’s Department of Psychology and the study’s senior author. “The results are consistent with an extensive body of research suggesting that we form spontaneous judgments of other people that can be largely outside awareness,” adds Freeman, who conducted the study as a faculty member at Dartmouth College. The researchers directed their efforts on the amygdala – the part of the brain known to be heavily involved in human social and emotional behavior. Previously, the amydala was shown to become active when judging the trustworthiness of faces, but it wasn’t clear if the structure was active when the signal (visual face cues) didn’t reach perceptual awareness. To study how the amygdala responded to such stimuli, the researchers presented a series of photographs to study participants in order to gauge their activity levels. The photographs featured both real human faces and computer generated ones with various degrees of trustworthiness, like low, neutral or high. The computer general images were based on proven metrics for trustworthiness: higher inner eyebrows and pronounced cheekbones are seen as trustworthy and lower inner eyebrows and shallower cheekbones are seen as untrustworthy. Before the actual experiments, the researchers tested how accurate their images were at soliciting trust, so they asked a separate group to rate them. Indeed, subjects strongly agreed on the level of trustworthiness conveyed by each given face. Onto the actual experiment, the researchers presented yet another group with the same images, with some key distinctions. This time, the volunteers viewed the faces while inside a brain scanner and, most importantly, they were only briefly exposed to the faces. Each image was shown as a flash, appearing on the screen for only a millisecond – definitely not enough to consciously recognize any features – and was followed by a ‘backward max’. Backward masking works by presenting subjects with an irrelevant “mask” image that immediately follows an extremely brief exposure to a face, which is thought to terminate the brain’s ability to further process the face and prevent it from reaching awareness. In total, two experiments were performed: one where the subjects were screened for amygdala activity under flash exposure to faces, and another in response to a fully continuous spectrum of trustworthiness. The findings suggest that even though the subjects never become aware of the faces they were exposed to, their amygdalas were hard at work both tracking and assessing face trustworthiness signals. Apparently, first impressions are made in the millionth of a second. Findings were reported in the Journal of Neuroscience.